Seth Godin is a very influential man, and his views on PowerPoint carry a lot of weight. He wrote a famous post a while back (1.5k Facebook shares, a gazillion tweets about it etc) on creating amazing presentations - you can read it here. I agree with lots of it completely, but I'm not totally on board with the five rules at the end. No more than six words on a slide. EVER. There is no presentation so complex that this rule needs to be broken. To me this seems too arbitrary. Fewer words is without doubt better than more words when it comes to slides - they're presentation tools not written documents. But six? As the maximum ever? Unless that's based on research that shows seven or more words reduces the effectiveness of your PowerPoint, why limit yourself in such an extreme way? I'd say one or two sentences to ensure brevity but allow yourself a little flexibility in conveying meaning and nuance. No cheesy images. Use professional stock photo images. First of all there are plenty of cheesy professional stock photos! Authenticity is key. The trick is to find images which look like the camera has happened upon a real scene - lots of pro stock images show impossibly perfect people laughing flirtatiously over a blank iPad, I mean come on. I find Pixabay and Unsplash have enough for most presentations I make, plus someone introduced me to Pexels the other day which looks good, and they're all free - both of copyright and financial cost. The professional stock photo sites cost a fortune to use - why use them when so many great (legal) images can be found for free? No dissolves, spins or other transitions. Yup. No argument here. If it's extraneous to your story, all you're doing is reducing the impact of your message. Sound effects can be used a few times per presentation, but never use the sound effects that are built in to the program. Instead, rip sounds and music from CDs and leverage the Proustian effect this can have. If people start bouncing up and down to the Grateful Dead, you’ve kept them from falling asleep, and you’ve reminded them that this isn’t a typical meeting you’re running. I like the idea about using music etc but it really needs a certain type of high energy presentation performance to pull this off. It's not for everybody (I couldn't do it). It's hard to think of a rule around sound that is absolute; it all depends on your audience, and some of them way think the use of music is a little distracting, whatever your music taste... From what I understand about the Proustian effect it's a very personal thing; I'm not sure a presenter could expect to cause or induce it for a room full of people. Header pic is a CC-BY image by Betsyweber - clcik to view original on Flickr. So what would I put in my top 5 rules for creating amazing PowerPoint presentations? I can answer that question because the intro to my full-day Presentation Skills training is built around five golden rules, based on existing research into what makes for an effective presentations - and that's the aim here, to build something which works. 'Amazing' is no good on its own; you need people to remember your key messages, not just how great a presenter you were. Keep it simple. Slides don't need to be flash - get rid of anything that doesn't tell your specific story, and leave behind something which supports and reinforces what you're saying out loud, and prompts you as to what to say next. No more bullets. Bullet points ruin slides. They're fine for documents, but you're not making a document in PowerPoint. As well as being symptomatic of a general Death By PowerPoint malaise, they make people less likely to agree with, understand and remember your presentation. Oh and they like you less when you use them. That's enough of a reason to never use them, surely? Make one point per slide. Make your point, allow your audience to digest it, then move on together in sync with them. Several points on a slide inevitably result in your audience moving at a different pace to you, because they can only listen and read for a few short seconds. Why be in conflict with your presentation materials when you don't have to? Give each key message room to breathe. Big fresh fonts. Font size 24 is the absolute minimum you should ever use in slides. If you need more you're trying to fit too much on one slide. Either ditch some text or cascade it across two slides. Non-standard fonts (which is to say, fonts which don't appear in the Office Suite) can, if chosen carefully, increase the impact of your presentation. Typography is underrated. More images, less text. Too much text stops slides working. Relevant images help people learn. Make the most of your opportunity with each new PowerPoint you make! If you've got a great idea, don't dilute it. Simplicity results in better traction for your idea. You need to give people one idea at a time, so they can grab onto it, digest it, and see how it relates to them. Not only that, but the simpler the idea, the more likely it is for people to share and pass it on. Think about the really successful online writers, like Seth Godin. He's made a career out of taking single concepts, focusing on them one at a time, and getting a bajillion hits to his blog as a result. Once people buy into his one-key-thing-at-a-time approach to ideas, they're then more likely to buy into him as a concept, and push his (more complex) books up the best-seller charts. So, keeping things simple isn't dumbing down. It's providing people with an easy way-in. That's just good marketing. Much of marketing is to simply get people in the door - THEN you can give them a whole variety of reasons to say inside. Most of the readers of this blog work in the information profession, like I do. This means we have a complex sell. Library services are myriad, but your promotion must be in bite-sized chunks. 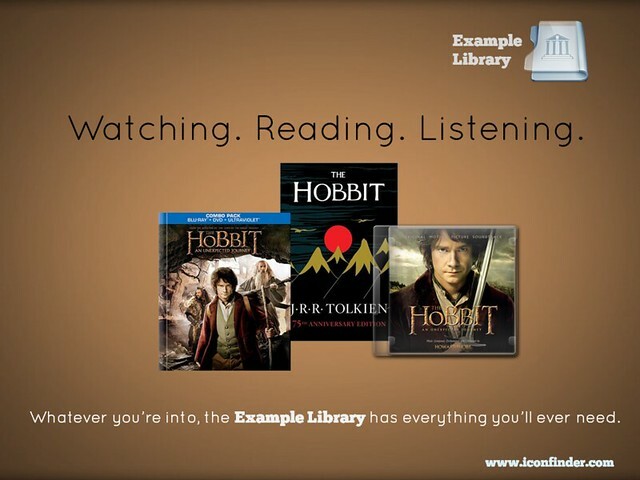 Libraries are complicated, but your marketing must not be. The secret to good communication is to market one thing at a time. 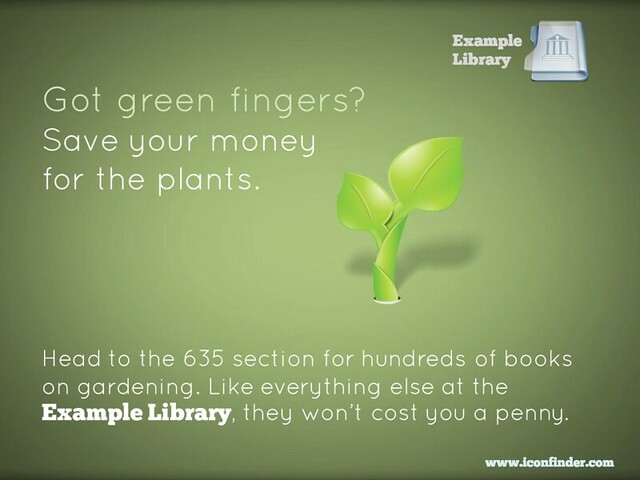 Here's an example of a poster promoting a library. In theory, it ought to be good. It looks okay, uses a nice font. 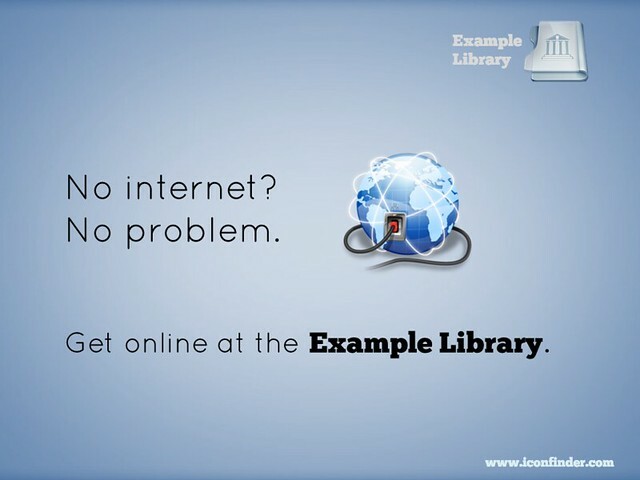 But more importantly, it tells you about all sorts of amazing library services! What's not to like? How you can resist this? Finally, if you really want to put several library services into the same piece of promotion, you can do this and STILL have the one simple message for people to take away. 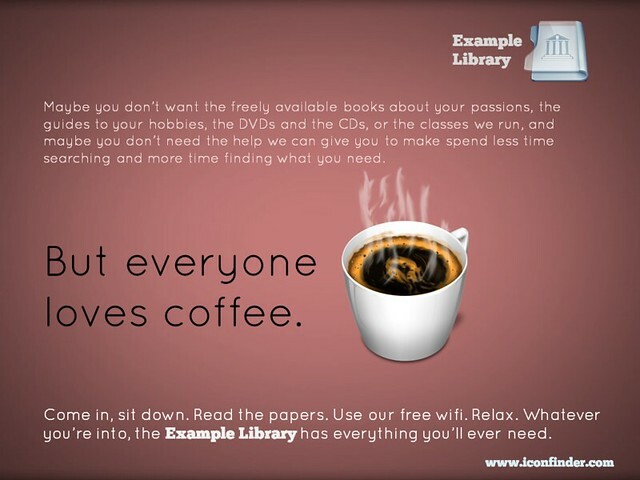 In the example below, you're saying to people that the library is a welcoming place, that they can come in and use the wifi and enjoy the cafe, without being judged for not using the books and journals. But you're also listing all the other things they MIGHT do if they so desire. As I said above, much of marketing is to simply get people in the door - then you can give them a whole variety of reasons to say inside. So remember, keep it simple. Market one thing at a time. It WILL yield tangible results. "We need librarians more than we ever did. What we don't need are mere clerks who guard dead paper. Librarians are too important to be a dwindling voice in our culture. For the right librarian, this is the chance of a lifetime." 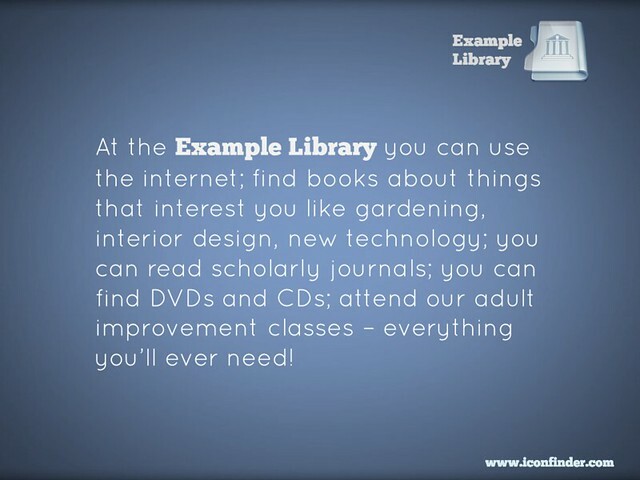 Seth Godin has written about libraries again! And this time I think we'll like what he has to say a whole lot more than we did last time... The quote above particularly reminds me of Phil Bradley's view (with which I agree whole-heartedly) that the massive revolution information and our profession is undergoing and will continue to undergo, is a fabulous opportunity rather than just a threat. But like Seth says, you need to be the right kind of librarian to make it happen - and I think lots of us are. You can read Seth's entire post here - it's well worth it, quite uplifiting really. I liked this quote, too: "The librarian is the interface between reams of data and the untrained but motivated user." Seth Godin (remember him?) has just written a blog post about alignment. It's well worth a look. Alignment is very important to libraries (the SLA are devoting lots of resources to this subject). In particular we need to spend more time ensuring we align our language with those of our stakeholders - and that may mean seperate language for our customers, and for those who hold our purse-strings. So we must promote our services to customers in terms they understand and relate to, and we must demonstrate our value to internal stakeholders by using their language, their terminology, and by focusing on factors they see as vital for measuring success as well as the ones we traditionally use. The Walmart relationship: I want the cheapest possible prices and Walmart wants to (actually works hard to) give me the cheapest possible prices. That's why there's little pushback about customer service or employee respect... the goals are aligned. The Apple relationship: I want Apple to be cool. Apple wants to be cool. That's why there's little pushback on pricing or obsolence or disappointing developers. The search engine relationship (when it's working): I want to find what I'm looking for. You want me to find what I'm looking for, regardless of the short-term income possibilities. The Dell relationship: I want a cheap, boring, reliable computer. You want to make more profit. The hip designer relationship: I want the new thing no one else has yet. You want to be around for years. The search engine relationship (when it doesn't work): I want to find what I'm looking for. You want to distract me and take money to send me places I actually don't want to go. The typical media relationship: I want to see the shows, you want to interrupt with ads. Alignment isn't something you say. It's something you do. Alignment is demonstrated when you make the tough calls, when you see if the thing that matters the most to you is also the thing that matters the most to the other person. So - you can guess where I'm going with this. What is the library relationship now, what should it be, and what will users put up with (with very little 'pushback') if their expectations are met? Think of this as an open thread - I'd be really interested to hear your views in the comments. I have two favourite facts in all the world. One is that there are more people alive than dead. (Oh my God! There are more people currently walking about on earth than have walked on earth in all of previous civilisation put together! Eeek! etc) The other is to do with the way many animals are born 'older' than humans. As we all know, a human is absolutely defenceless and fairly useless when it is born - it needs to be fed, and protected, and it can't walk, or really do anything. Your average horse, by contrast, is born, stands up, and is basically ready to gallop off down the shops for some fresh coffee and a copy of the local paper. Many animals go through the bit where they are helpless before their birth, meaning they are better equipped to survive once they are born. The main reason humans can't do this relates to our previously having walked on four-legs, and via evolution having made the transition to two-legs - in order that our hips and pelvis could support us as bipeds, they had to become much stronger. That meant (if you don't like the phrase 'birth-canal', look away now...) narrowing the birth-canal, which means we humans have to born earlier if we're to get out at all. Hence, we arrive 'younger' and ill equipped to deal with the world. I think there are parallels with information in both cases. The first is fairly frivolous, but nevertheless - there is much, much more information in the world today than in all of human history before us. (In fact, it is thought that more information is produced each and every day, than existed in total 100 years ago.) Here's a scary ticker showing the amount of information created this year alone, courtesy of EMC. It is increasingly being recognised that we will soon be drowning in a deluge of information, and I've said before I think too much information is as prohibitive as too little. So the Information Professional has a role to play here, separating the good quality information from the stuff you can't trust. In the second case, the digital revolution has effectively allowed information to be 'born younger', just like us. As the line between creator and consumer blurs (with the internet itself providing an instant publishing medium, and the increase in sharing and user-generated-content that defines Web 2.0) then information is increasingly available to us earlier in its lifecycle - perhaps prior to peer-review, or referencing, or even fact-checking. Where previously information had to go on a fairly lengthy journey between being written down by an author and ingested by a reader, now the two can happen all but simultaneously. And as such, some information is, like a human baby as opposed to foal, in need of help and guidance. We Information Professionals can help nurture information and ensure it gets to consumers in good health (which is to say, in a useful state). As I said in the comments, it illustrates the shift from Enforcer to Sherpa that we must undergo, and hopefully are undergoing already. There are already signs that consumers of information are ready to be guided, as I will try and illustrate in part two of this, tomorrow.